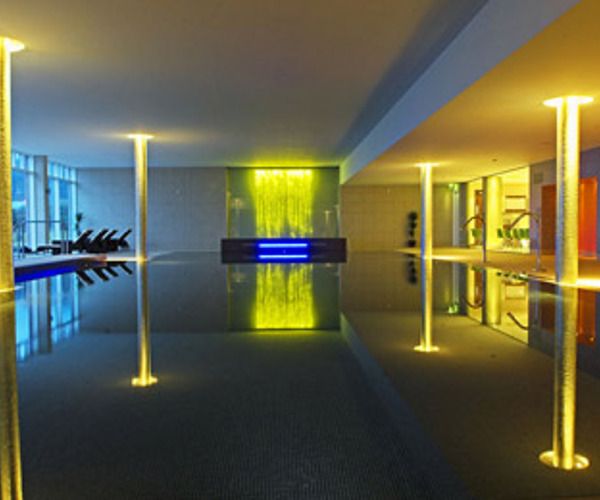 Soak in the Vitality Pools – and breathe in the stunning views across the Irish Sea. Built in 1897, the Slieve Donard (named for a nearby 3,000-foot-high mountain) is located at the foot of the Mourne Mountains in Newcastle, one of Northern Ireland's most famous scenic destinations. The hotel's turreted Victorian facade overlooks the shores of Newcastle Bay, where majestic eastward views are accessible from a four-mile (6.5 kilometers) beach. The property occupies six acres of publicly held grounds adjacent to Tollymore Forest Park. Inside, renovated and restored facilities include an oak-paneled drawing room with a crackling central fireplace. The newest addition to the property is a 35,000-square-foot spa (opened in August 2006) constructed with natural elements such as stone, Mourne granite, and sea-washed pebbles. ESPA, the renowned spa consulting company, created this two-story facility in accordance with holistic and restorative principles. Among the spa's rejuvenating features are a lounge with beach views serving spa cuisine; a fully equipped, technologically advanced gymnasium; and male and female thermal suites housing an amethyst steam room and a rock sauna. Golf enthusiasts can enjoy world-class fairways next door at the Royal County Down Golf Course. Authentic Irish country pubs and picturesque woodlands await those who explore the surrounding area. Opened in August 2006, the Spa at Slieve Donard reflects the holistic and therapeutic focus for which ESPA is well known. The famous spa consulting company presided over the creation of a two-story, 35,000-square-foot facility that incorporates elements of the surrounding landscape into its soothing spa design. Window slits admit shafts of natural light, which softly illuminate the subdued earth tones that dominate the color scheme. Subtle mood lighting enhances the atmosphere in all 16 treatment rooms and in the gender-separated thermal suites, where an amethyst steam room, rock sauna, spa showers, and hydrotherapy pools can be found. Treatments are drawn from the healing traditions of the world's most ancient cultures. A signature service, the Advanced Ayurvedic Hot Stone Massage and Body Wrap is individualized based on the recipient's dosha, or mind-body type, as ascertained by the spa therapist. The treatment commences with a foot ritual, followed by a salt and oil exfoliation. This aids in the absorption of a customized blend of herbal oils and concentrated natural ingredients that is poured onto the body as prelude to a hot or cold stone massage. An algae, clay, or mud wrap is then performed to nourish and detoxify. Oriental head massage with herbal steam therapy provides a cleansing final step. The facility also encompasses a heated pool with breathtaking mountain views. On the ground floor, a spacious gymnasium contains state-of-the-art Technogym equipment and a fitness/meditation studio offering a wide range of complimentary classes. Slieve Donard can serve as a luxury spa destination in itself, a cushy base from which to explore the scenic Newcastle area, or both. Adjacent to the hotel, the Royal County Down is composed of two 18-hole golf courses that have hosted the Curtis Cup and the British Seniors Open Championship. The nearby Ardglass Golf Club offers championship-level play and far-reaching Irish Sea vistas. The famed natural landscape of Newcastle provides an extensive array of outdoor adventures and excursions. The possibilities range from leisurely walks along Newcastle Bay to strenuous hikes up the hotel's namesake, a 3,000-foot-high mountain of grass and granite whose peak affords views that extend all the way to the Isle of Man on clear days. The Silent Valley Reservoir Mountain Park is located high in the Mountains of Mourne, surrounded by picturesque countryside panoramas. Tollymore Country Forest Park encompasses more than 13 miles (22 kilometers) of woodland hiking and biking trails. Numerous sites of cultural and historical interest can also be found in the area. Down Cathedral, parts of whose walls dates from the 13th century, is thought by many to be the burial place of Saint Patrick. In the 18th century, the Down County Museum was a jail that housed prisoners prior to their exile to Australia, then a penal colony. Today, the Museum exhibits artifacts that narrate the history of the area now known as County Down, from the Middle Stone Age to the present. 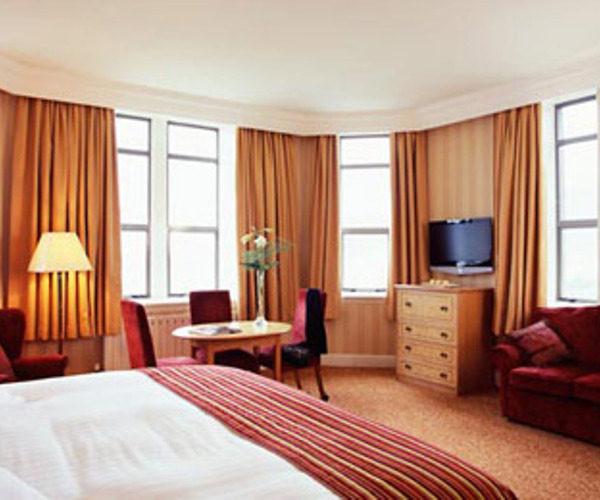 Slieve Donard's 175 guest rooms and suites feature luxurious decor and furnishings. The majority of the accommodations afford splendid views of the majestic Mountains of Mourne, the sprawling fairways of the Royal County Down Golf Course, or the Newcastle Bay strand. As part of the 2006 renovation, 56 brand-new rooms were built directly above the spa. Newly refurbished, all rooms and suites have plasma-screen televisions and plush linens. Oak Restaurant serves traditional Irish fare prepared with locally harvested ingredients. Open for breakfast, lunch, and dinner, this restaurant offers both table d'hote and a la carte dining options in an atmosphere of Old World elegance. Bay and garden views and the interior's distinguished oak paneling provide a rich meal for the eyes. Hotel guests can mix with locals at the Percy French Inn (Mr. French was an Irish songwriter who immortalized the area in his famous tune, "The Mountains of Mourne"), a favorite of Newcastle natives for its informal pub-style lunches and dinners as well as its cozy fireside environment. Nutritious spa cuisine is available at the Lighthouse Lounge, whose leather wicker furnishings and wood accents blend with its spa surroundings. Also, the Chaplin Bar (named for Charlie Chaplin, who visited the hotel in 1921), attracts a lively crowd of area residents and international visitors.